Earlier this month Drake dropped two new tracks, "God's Plan" and "Diplomatic Immunity," on a short project titled Scary Hours. The Scary Hours artwork comprises of the title written in two different fonts on a black background. On Monday, January 22, electronic producer Rabit accused Drake and OVO of stealing the design from his own 2015 Communion Tour poster. “Today I wake up to see OVO has redone one of my tour posters,” he wrote on Instagram. The Berlin-based producer, who worked with Björk on her latest album, credited designer Collin Fletcher with his original imagery. "Poor Collin is always having his style stolen😬lol" he added. 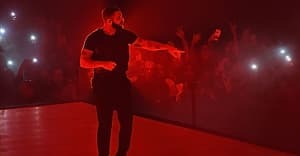 Speaking with Pitchfork, a source "close to the situation" claimed that OVO did not commission the artwork, and that it was one of several options for the EP that was offered to the label. The FADER has reached out to Rabit and Drake’s representatives for comment. Thumbnail images courtesy of Lane Stewart and Mark Peckmezian.